“Mills have to be cleaned thoroughly after every sample run,” says Oliver Vogelsang, product manager at IKA (Staufen, Germany). He adds that users should also check regularly for wear and tear on items such as seals and blades/beaters. Michael Gordon, senior service technician at Verder Scientific (Haan, Germany) adds that several things can go wrong if users don’t clean their units properly, or don’t clean them at all. Click here to read more about the importance of maintaining your mills and grinders. With over 20 years of experience, EZkem provides a host of lab analysis services including equipment repairs and reconditioning, onsite training of operation, and the best prices on consumables anywhere. EZkem repairs everything on past and current Alpkem and OI Analytical Autoanalyzers, including the FSIII, FSIV, FS3000, CNSolution as well as the current FS3100 and CN3100. This includes Ismatec Pumps, AI Scientific Samplers (RA Sampler), Cetac Samplers, Chemistry Cartridges, Powerbases, Heater Cartridges and Detectors. If you have a service issue with your autoanalyzer system, they'll help you find a solution. The world’s first patented Tube Mill control is a batch mill with disposable grinding chamber. Eliminates possibility of cross-contamination and the effort of cleaning. The grinding chamber and cover are made of a transparent material so grinding tests can be observed at any time. The mill can be used for hard (Mohs hardness up to 5), dry and brittle materials. During development of the mill, particular emphasis was placed on security. When the grinding chamber is not inserted properly or not closed properly, the drive unit will display an error message and the drive will not start. 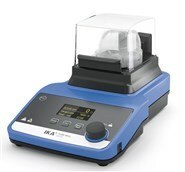 Visit the IKA website to learn more about the Tube Mill control. Question is about Alpine 200LS-N airjet sieve. What does q(B) % mean on the measuring report? How can I calculate it? Advise this member. I wonder if Applied Biosystems GeneAmp ® PCR System 2700 use the principle end-point of real-time PCR as method? Advise this member. We are using bc5380 hema machine and during closed tube test the compartment cannot be closed. How can I solve this? Advise this member. As part of their 'PIPETGIRL – Let’s fight breast cancer together!’ campaign - INTEGRA is committing to donating Euro 10 / US $15 for every PIPETGIRL purchased during 2015 to a selection of internationally renowned cancer research institutes. Read more. Molecular Devices, at SLAS 2015, launched a homogeneous, no-wash assay to measure ligand- and voltage-gated potassium channel activity. The FLIPR® Potassium Assay Kit uses a novel thallium-sensitive indicator dye and a masking agent to significantly widen the conventional assay window, enabling studies of channels with low conductance or low expression levels Read more. The BioFlo 320 is truly a step into the future for Eppendorf as a bioprocess equipment manufacturer. New features including autoclavable and single-use vessel flexibility, intelligent sensors, and IP network communication for multi-unit control set it apart as the new premium choice in the bench scale bioprocess market. Read more. RDM Industrial Products, Inc. manufactures and provides an array of quality industrial and laboratory furniture, including support products, to the Advanced Technology, Biotechnology, Electronics, Healthcare, and many other private and commercial industries. Established in 1977, RDM has been in business for over 30 years. Our facility is ready to provide your company with the quality furniture products and service you demand. We specialize in shipping top quality products to locations nationwide on time. Visit the RDM Industrial Products, Inc. website to see their full product line. In our lab we have a GSL-1600X furnace. However I want to use it for heating in an argon atmosphere above 600 K. Can I use the GSL-1600X for that. Can you send me a description of how to do that and what I should need for that? Advise this member. During the initializing phase, this message appears: <The spectrometer has a serious problem > and then: < No light, instrument failed initialization> , , Err115, wave drive not calibrated, no peak found>. Advise this member. The lid on our centrifuge has gotten increasingly hard to close making it harder to accomplish for lab staff of short stature. Is it due to hardening of the seals or something mechanical? Advise this member.